A post has been brewing for the past few weeks and the broadcast of today's On Your Farm (BBC Radio Four) tripped the creative switch. The farmer being interviewed has been incredibly successful over the decades at spotting consumer trends and understanding what they mean for farmers. He identified the trend for lean meat in the 70s, free range eggs in the 80s, organic food in the 90s, and local in the 00s. Not all of these trends have become dominating, long-term food movements but, in the farmer's opinion, local is a trend that is here to stay. There are probably lots of reasons for this, and as I nearly weep at the beauty of a swan flying past my window over the glassy surface of the river and through golden light of this early morning, I realise once again that I don't need to leave my neighbourhood to find beauty, and that the beauty in my local neighbourhood gives me a reason to be proud of it and to want to nurture and maintain it. The beauty allows me to brag, and bragging connects me to the beauty and, hence, to the neighbourhood. All of this philosophy to say that whilst venturing outside of my environment feeds me in lots of ways, there is also a lot to feed me in my local environment and it will be there all the time as long as I look after it and take advantage of it. How convenient! How environmentally friendly! How social! 1. To make good bread available in neighbourhoods up and down the land. 2. To help people to build relationships in their neighbourhoods. 3. To enable people to earn money by owning their own business, working from home. Funnily, we did not set up Bread Angles to take advantage of the "local" trend although clearly it will play in our favour (long may it last). We set it up because people need to be able to earn in new and different ways, because we seek to embed virtue more broadly in society and we believe that this will happen when people build relationships, and because we see that, through Bread Angels, we can make good bread widely available where currently it is not. We know that it will be successful because we see that people want to work in new and different ways, seek to make connections, and long for good bread. What we did not anticipate was that customers would also attracted by the fact that Bread Angel bread is local. I did not know this until I started talking to the shop keepers to whom I deliver. The fact that I am local is key: people know where I bake, the flour I use is available in the deli, whole loaves can be bought at the cheese shop, and a selection of my bread is offered before your meal at one of the restaurants on the high street. The bread is good. The fact that it is baked extremely locally (like, within one mile) is even better. "Fleur and I arrived at 8.30 armed with 24 loaves, 18 rolls and 22 slices of cake, and had sold out of the bread by 12.30 p.m. So all in all, an encouraging beginning!" "Well, what an amazing two days! We sold out of bread again and I even had people coming back from the day before to buy more!" I am so proud of Sue I could burst. 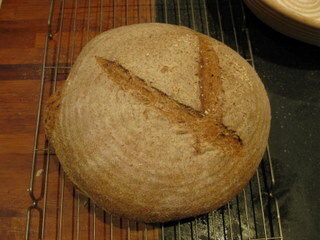 Rosie has Bread Angels courses lined up in both Leicester and North Norfolk. I have more courses set up in London. We have asked our lovely web designers to build a Bread Angel finder for us so that it is easier for people to find good, local bread baked by a Bread Angel and/or to find a Bread Angel course that will teach them how to set up and run a home baking business. The aim is to have Bread Angels up and down the land - in every neighbourhood in fact! Good local bread for good local people made by good local bakers.